We hope everyone is off to a good and happy start at this new year. This is the time to reevaluate our goals and progress. My goals at the observatory for this coming year are to (1) Continue with ongoing physics and cosmology study and build more experience with making astronomical observations, (2) develop some science type observation plans, which can actually contribute to the amateur input to valuable professional astronomical studies, (3) make measurements of the visible magnitude changes associated with variable stars and eclipsing binary stars, and (4) move more fully into measuring spectra from stars and other objects. the amateur must be able to achieve good telescope alignment skills and stellar tracking capability so that long term observations of variable stars, that are not always close to easily recognized stars, can be tracked for long periods. I'm not always as diligent in setting up the scope to meet these needs. Second, is the need to be able to operate and find objects with the scope set up for higher magnification and thereby smaller field of view. The telescope pointing and tracking accuracy must be much more accurate than I normally achieve so that when the scope is commanded to go to a particular star, the dim star of interest can actually be found in the eyepiece. Third being able to measure stellar visible magnitudes and positions on the sky that can be traced back to and calculated from the well known and published positions shown in star catalogs. And finally, acquire a more sensitive spectrometer, which I believe Santa, rather than rely on the reindeer, has already put on an airplane in France, which should arrive here in California shortly. Wow, this sounds like a lot of work, but it should also still be fun. At the OCA Blackstar Canyon party this last weekend, I had a great plan of working on some of these skills and getting better polar alignments with Polaris. My plan also included trying to use my new 2.5 times and 5 times Barlow lens to get astro images with 2.5-5 times better resolution and detail. With this new capability I hoped to get some photos of selected star fields and then be able to rely on the better scope alignment to get better estimates of the actual sky location in terms of right ascension and declination. Why is this important now? Well, if you identified some strange object like a comet, or some bright supernova, or just some unknown star, how would you tell any other observers where to point their telescopes to see the same object. These images could be used to then the telescope reported measurements can be compared and correlated with the real accurate positions used by professional astronomers. Comparing this estimate of position with established star charts, available with my astronomical image processing software, AIP4WIN, means you can say exactly what is the position of the object. Well, this first night of observing, with these new goals in mind, did not progress as planned. As all of you amateurs know, something sometimes comes up that interferes with the plan and creates a learning opportunity. The Blackstar location had some leftover clouds and the temperature was very cold. Resident Astronomer Peggy choose not to brave the cold and stayed at the observatory to protect if from the continuous chewing by Astronomer Assistant Ruby. 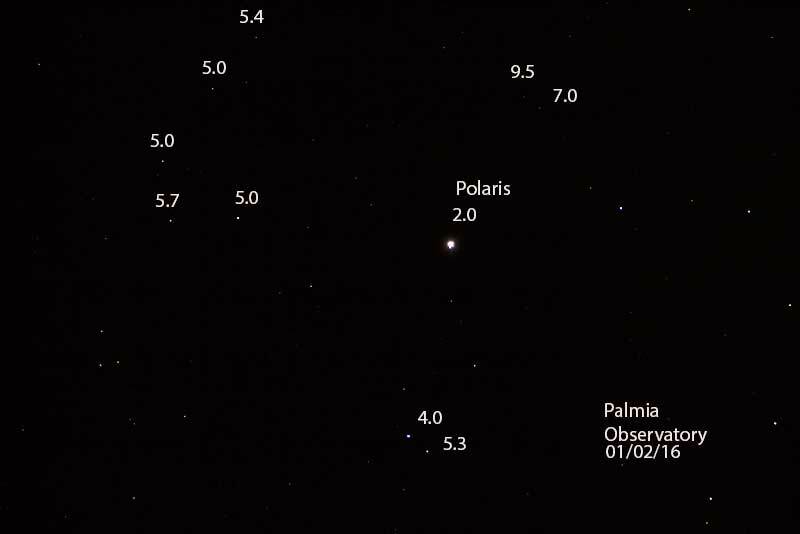 So, I set up by myself and I got a much improved alignment with Polaris, once it came out of the clouds. When I compared this most accurate alignment with Polaris, that my previously used guesses were off by about 4 degrees in elevation. No wonder I was seeing star trails in some of my photos from earlier weeks. Then as I tried to complete the alignment with two more stars, the telescope hand controller started to misbehave and had a case of double vision on the 2nd display line. What was going on? One thing for sure is that my telescope battery ran out of juice. Darn! Well, I had learned in the past to bring a spare battery. So, I started over again with my spare battery and that battery ran out of juice too! I wished I had topped off the batteries before I left, but it seems the weather was so cold that the batteries just couldn't keep up. Also, I found that with my gloves on, I couldn't push the camera buttons and operate the scope and had to keep taking them off and putting them back on again. It just wasn't going to well. I might have to get some thinner, more useable but not as warm, gloves. At least Amateur David, who chose to brave the cold with just his binoculars, brought some tasty Carmel corn to help weather the cold. Thank you David. Without any power, I just left the scope pointing at the North Star. So after just taking a couple of photos of the star field around Polaris, I tried to install the new Barlow lens and found I couldn't get any focus at all. I couldn't get enough back focus and couldn't find the right configuration of adapters to get the right amount of back focus. It just wasn't going to work and I couldn't figure it out in the dark. So, with the dead batteries and all, I packed up and called it quits for the evening, as did the other half frozen folks. It was just too cold. But, I do have three photos to share. First, as you probably already know, Polaris is at least a double star, with one bright star and one dim companion. Look carefully at the first photo and see the two stars together. You can just barely make out the close companion. I need more magnification to resolve the star's more than that. The second photo shows my first attempt at measuring the visible magnitudes of the stars in that star field around Polaris. I'm still learning how to use the AIP4WIN software which has a lot of features to measure the sizes of stars and distances between stars. When I click on any star in the image, the software automatically determines the size of the star's image and draws a couple of concentric circuses around it and then adds up all the pixels in the star's image and the background sky and subtracts to give the amount of light in all of the affected pixels. It also can combine overlays from professional star catalogs, which the amateur can use to identify exactly how his telescope is pointing and thereby being able to measure the distances and right ascension and declination of any object in that field of view. I'm just beginning to see how to do that. I did use the software to get my first ever estimate of the magnitude of many of the stars around Polaris. 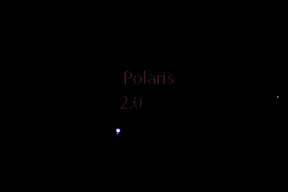 Using the Polaris magnitude = 2 as a reference, which helps remove most of the effects of my own individual camera, the magnitudes of other nearby stars can be measured and reported. My measurements are shown in the second attached photo. Some of the measured magnitudes don't match up with my intuitive guess as to the relative brightness of some of the stars, but I'm just going with the data and reporting my initial measurements. There could still be some hidden effects in the measurements that I need to take into account but don't know enough about that yet. For example, I'm worried about how the brightness of a star might be more of a function of its color and my camera sensitivity might not be reporting the corrected light intensity, of some such thing. More study is required. Lastly, after I returned to the warmth of the observatory, I think I found that once the batteries had warmed up to room temperature, the hand controller double vision was gone and the scope was operating properly. So, the power problem indeed seemed to be the poor low temperature performance of the batteries was the cause of the power failure. Now I understand why many amateurs wrap their batteries up in warm blankets so they can make it through the cold weather. Also, I found a combination of adapters for my next attempt at getting enough back focus for the Barlow lens. 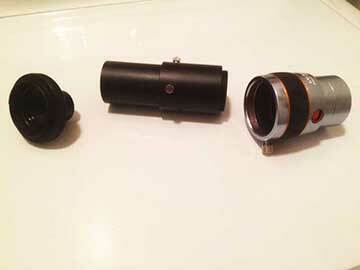 The attached photo shows the Barlow lens on the right, where it would attach to the telescope. Then, shown in the middle is a projection adapter, which just adds extra, adjustable space to enable focus. The final adapter at the far left in the photo is the T-ring adapter used to mate with the camera. Hopefully, this arrangement, which can add about 5 inches to the back focus, will be flexible enough so that the Barlow lens can be focused correctly. If this works, one of the first things I want to try to do is resolve the two visible stars in Polaris and be able to measure the magnitude of each one individually and the arc distance between them. So, I guess the lesson of this week is that things will go wrong, but you can continue to make a little progress with each setback. It's amazing that amateurs keep on going in the face of all of these setbacks. Now, we just need some clear skies and maybe just a bit warmer skies to try everything out.